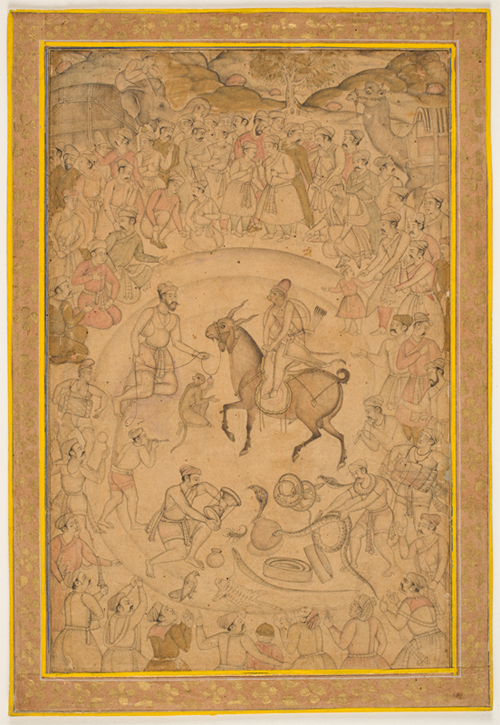 Fine drawings of this type were popular during the last decades of the reign of Akbar, the greatest of the Mughal emperors. They were often included with paintings in illustrated manuscripts of the period or were mounted in albums containing paintings and alternating pages of calligraphy. The borders of the present drawing, once part of an imperial album, were trimmed and the original format was altered when the album was dispersed. The disparate elements of this scene, whose meaning is unclear, are blended masterfully in a circular composition. It illustrates an impromptu performance of five musicians and three animal handlers before a crowd of fifty-three eager men and boys. The amusements include animal combats orchestrated by a man with an hourglass and, at the center, a circus act with two monkeys and a strange hybrid creature. The presence of this beast, with the combined features of a donkey and a goat, suggests that the subject is not a genre scene but rather the illustration of a legend or fable.